﻿ Fresh Basil Pesto – Low Carb And Delish! 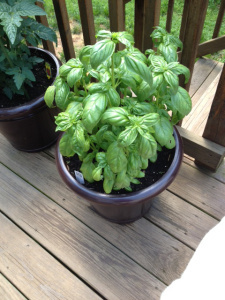 Thanks to the rain, it’s time to start picking basil leaves and make some tasty pesto. Guess what I made today. I love pesto and thanks to all the rain we’ve had lately, my basil plants are growing like gang-busters. I had enough basil leaves for two cups of delicious pesto! Pesto is a great low-carb topper for chicken breasts and fish. I’ve even used it in place of salad dressing too. For lunch I’m using on fresh mozzarella and tomatoes. Yum!